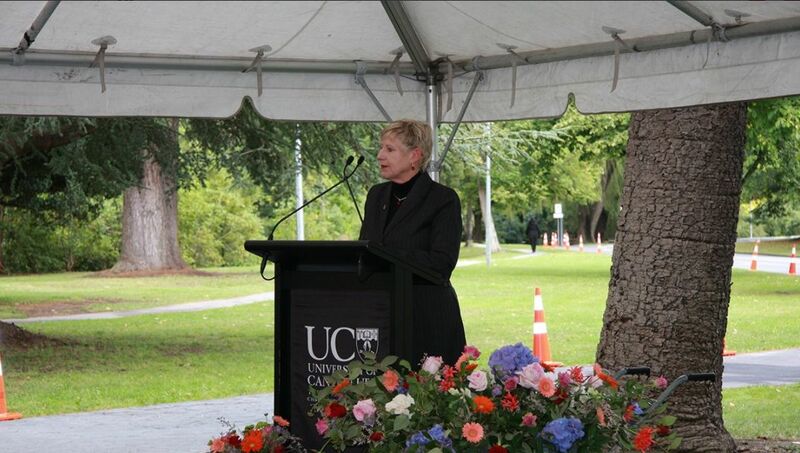 Christchurch Mayor Lianne Dalziel spoke at the dedication of the new commemorative pathway and the sculpture Roimata on 22 February. Thank you for the honour and the privilege of sharing this occasion with you as we unveil this commemorative sculpture, Roimata, and dedicate this part of the cycleway to the memory of the February 22 earthquake in 2011, both acknowledging and remembering the losses and injuries sustained by students, alumni and friends of the University. Events to commemorate that day, act as reminders of all that we have lost, but on this occasion we will also be called upon to reflect on the incredible spirit that emerged from the community, exemplified at this place, the University of Canterbury, by the Student Volunteer Army. I have not yet seen Roimata, but I am confident that when we see her, we will feel that Riki Manuel has captured both the sadness we feel on remembering that day and the generosity of spirit and courage that became the hallmarks of what followed. The events of February 22, 2011 and the weeks, months and years that followed may have changed the face of Christchurch forever, but the heart of what makes us who we are as a community, a university and a city has been strengthened by our shared experience of grief and loss, coupled now with our immutable optimism for the future. The University of Canterbury can be proud of the role it played and will continue to play as we turn lessons learned into global best practice for the future. And today you can be proud of creating this special place of remembrance and honouring our shared sense of loss and the spirit that flowed from the tears.